More than 50 residents attended DDOT’s community meeting to hear resident feedback on the PA Ave/Potomac Ave intersection redesign. CM Charles Allen is in the center of photo. 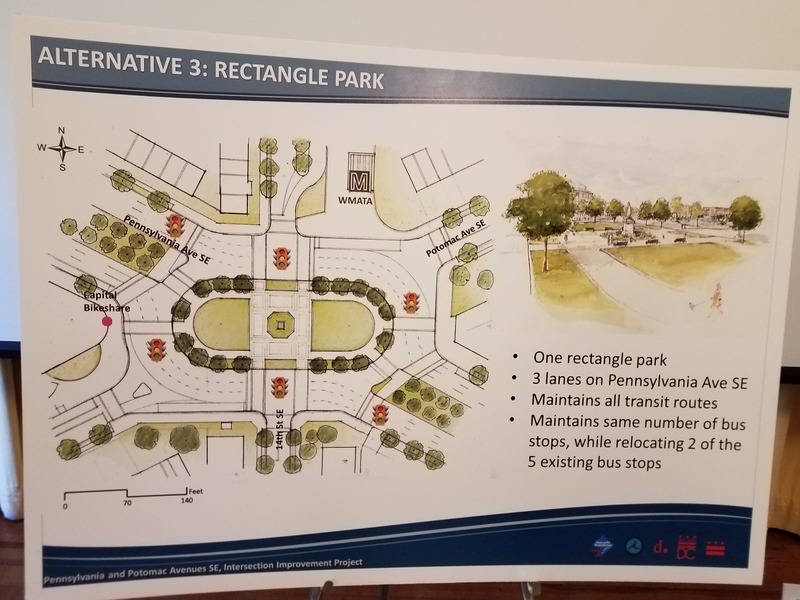 Alternative 2. the Rectangle Park Design. Alternative 3. 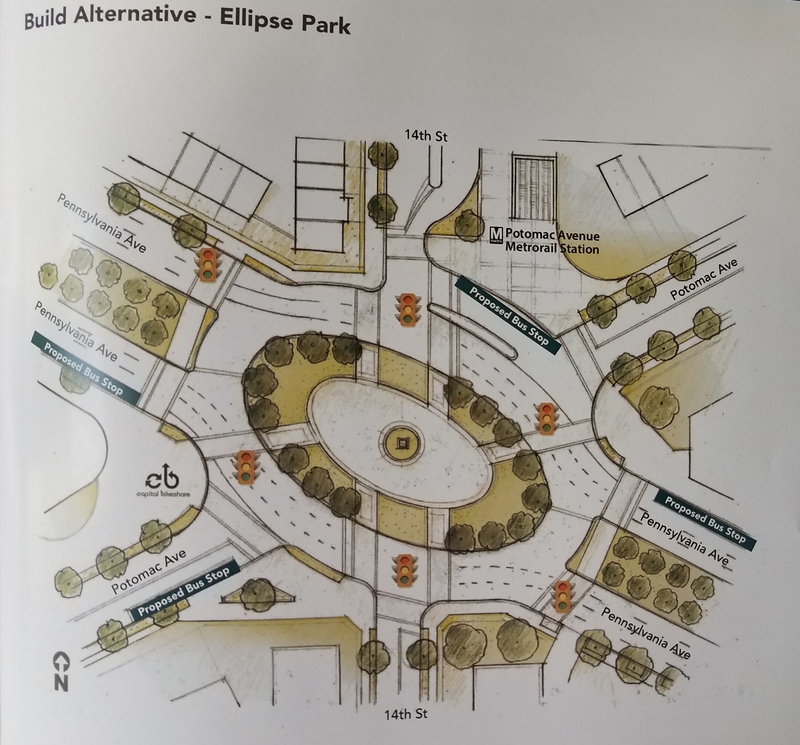 The Ellipse Park Design. 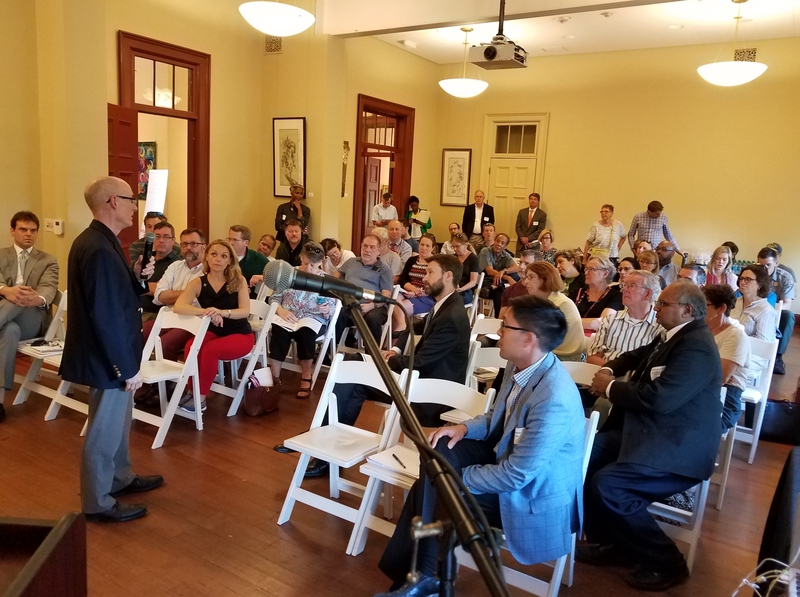 Thursday night, DDOT hosted a community meeting at Hill Center to release the Environmental Assessment and get input from residents on the redesign of the confusing and dangerous Pennsylvania/Potomac Avenue SE intersection. 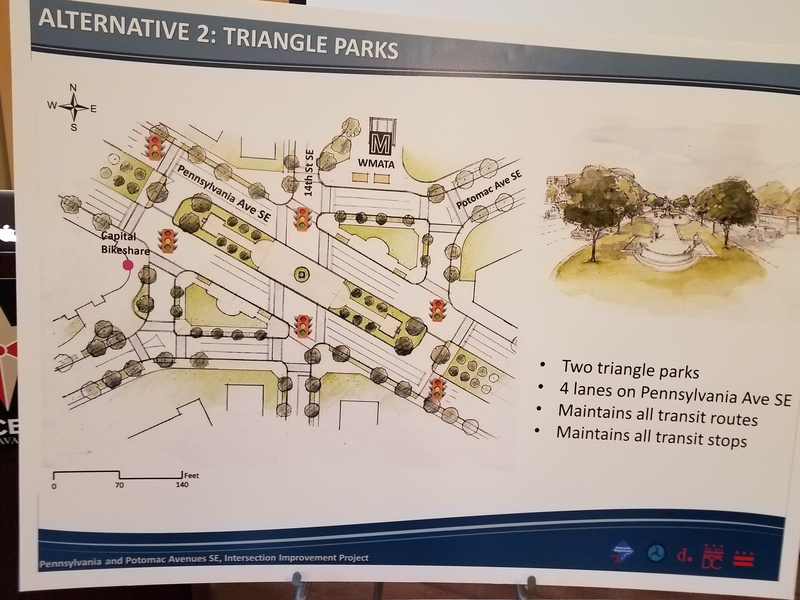 Councilmember Charles Allen opened the meeting, asserting that the intersection does not work and that residents should not feel wedded to any of the three designs DDOT planners have come up with – that elements of one design could be incorporated into another. Allen said the focus should be on pedestrians and how the intersection can work for the community rather than just moving traffic. Most important, he said, was determining how the intersection can improve pedestrian safety and work for the neighborhood. 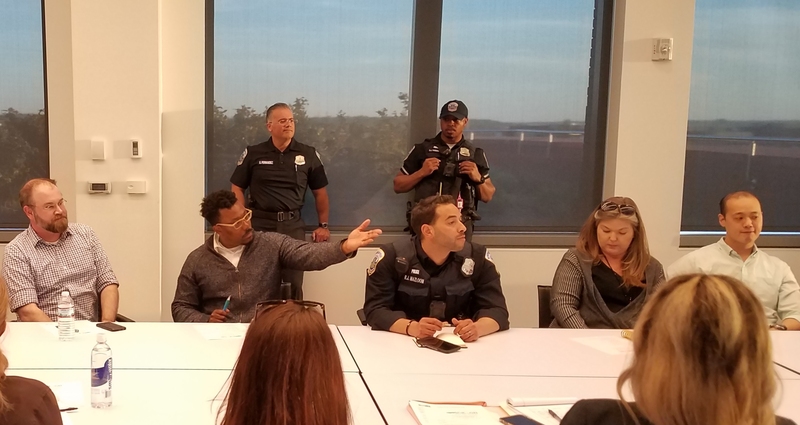 DDOT representatives told residents that the meeting marks the beginning of the public review period prior to the Environmental Protection Agency decision on the project. Residents will have until June 30 to comment on the plans (info below). 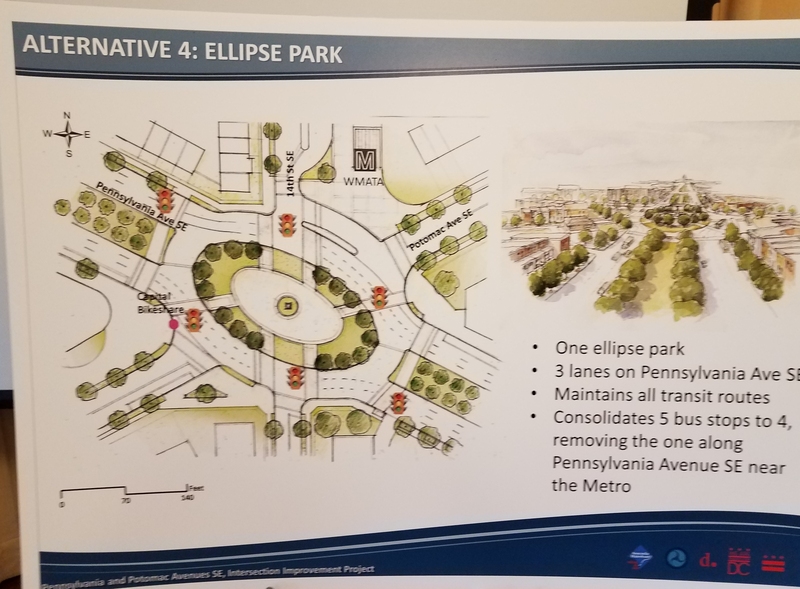 Once public review of the Environmental Assessment and the three designs is complete, DDOT will make a decision on the redesign this summer. Following the selection of one of the alternatives, it will take about a year to complete final design and a little longer for that for the National Park Service to transfer any lands to the city, should that be necessary. 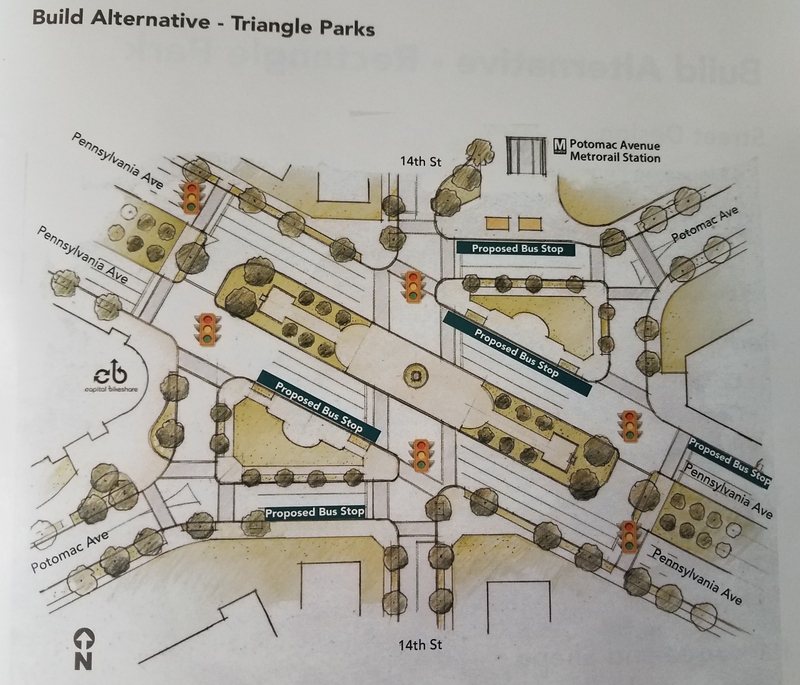 Triangle Park Design: Most like existing condition. The resulting park/green space in the median would be 25,000 square feet (one half acre) and could contain a sculpture or water element. 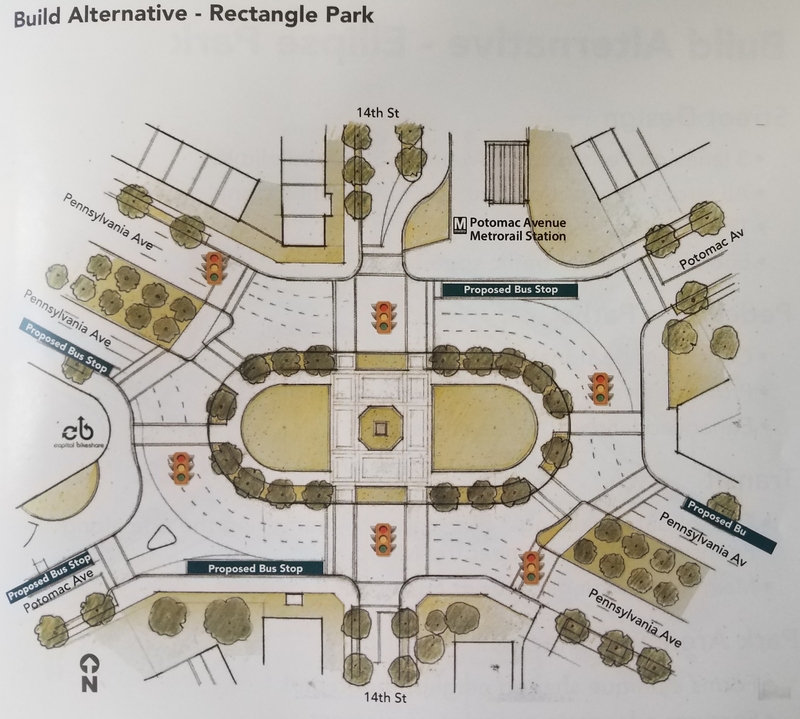 Rectangular Park Design: Encourages low transit speed and would feature a mid-block crosswalk, sculpture or water element, and enhanced landscaping and hardscaping. The center park – 25,500 square feet – could be lined with trees and would provide a place for civic activities. Ellipse Park Design. Encourages low transit speed and would feature a mid-block crosswalk, sculpture or water element, and enhanced landscaping and hardscaping. The center park – 34,300 square feet – could be lined with trees would provide a unique shape for the neighborhood park. Many of those who attended expressed concern about the bus stops. All three plans maintain all bus routes through the intersection with bus stops generally in the same place or close to the same place. Several residents of Jenkin’s Row called the bus stop on Pennsylvania Avenue near the resident’s entrance, problematic in term of the noise associated with the bus traffic as well and the gathering of riders outside the residential entrance to the building. One resident told CHC that some 160 eastbound 30s buses stop at this intersection every weekday; all of those would stop in front of the main entrance to Jenkins Row under the Rectangle and Ellipse proposals. This is in addition to approximately 90 circulator buses that might stop there if DDOT so desires. Some residents want the stop shifted to the east side of the intersection on the 1400 block of Pennsylvania Avenue. See schematics depicting proposed bus stops below. 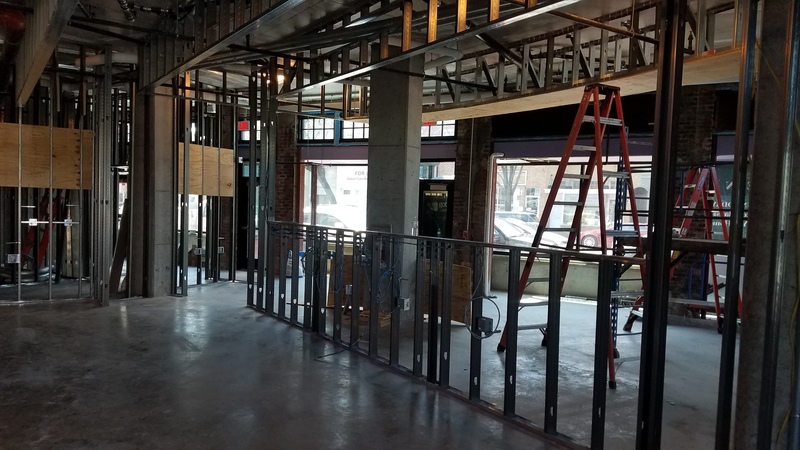 That address marks the location of the proposed development of the NY Pizza site at 1401 Pennsylvania Avenue, SE, where CAS Riegler Development plans to build a mixed retail/apartment project is a retail project at heart, with 19,000 square feet “Class A” retail, and 174 residential units. 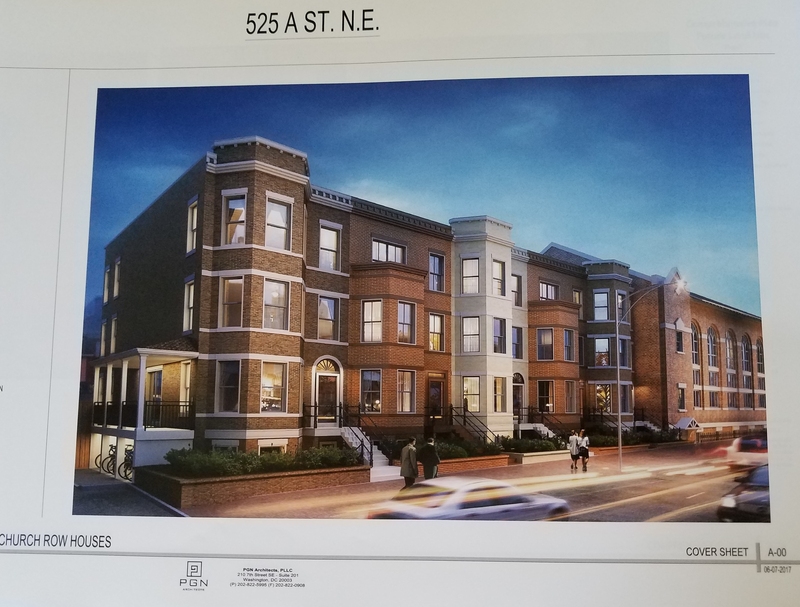 See here: http://bit.ly/2rzlhWy During the PUD process to change the zoning to permit increased height and density for the site, CAS Riegler agreed not to protest a bus stop on the south side of Pennsylvania Avenue in the 1400 block. The eastbound 30 bus stop should stay West of Potomac Avenue for people going to Harris Teeter, Safeway and Fragers.